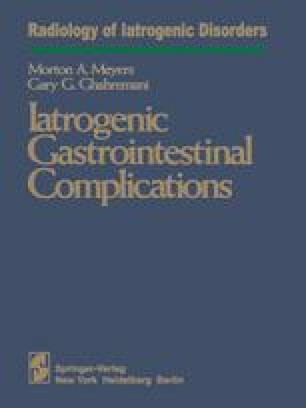 Intraperitoneal abscesses are now seen most commonly as a postoperative complication and are particularly frequent following cholecystectomy and gastric operations. In Wetterfor’s series of subphrenic abscesses, biliary tract diseases and peptic ulceration were responsible for the great majority, with acute appendicitis accounting for only 10% (1); in 60% of the total cases, however, the abscess occurred as a complication of surgery. Escherichia coli and other gram-negative bacteria are the dominant organisms cultured, but streptococci and staphylococci still play an important role. Many postoperative abscesses are secondary to anastomotic leaks (2).